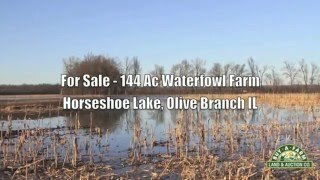 144-acre farm located ¼ mile West of Horseshoe Lake and 2+- miles East of the Mississippi River at Olive Branch IL. 115 acres is cropland, 23 wooded and balance roads and levee for the impoundment. Soils have a 104.7 PI with a weighted corn average of 139 bpa. It is one of the higher farms in the area therefore flooding is minimal in high water. The farm has an excellent history of waterfowl hunts. There is a 22-acre impoundment that can be flooded via a 8” well with electric pump. There are six 6-man buried pits; 3 in the impoundment, one West of the impoundment and 2 East of it. Another will be added soon. An older mobile home serves as a clubhouse. Waterfowl hunting and crop income. See you can “have your cake and eat it too”! Taxes: $1236.34 (2014 paid 2015). Originally listed at $1,050,000.